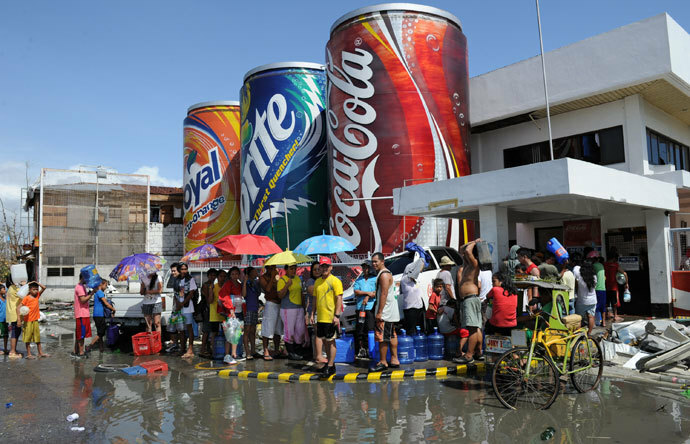 Driven to despair, survivors of Typhoon Haiyan in the Philippines turned to looting in search for food, water and medicine amid reports of warehouses and shops attacked in the aftermath of one of the strongest storms ever recorded. As essential supplies dwindled, tensions rose. Since the storm hit the islands five days ago, residents have broken into homes, shops and warehouses, where they have drained shelves of food, water and other vital goods. In the latest incident, Philippines security forces exchanged fire with armed looters in the village of Abucay, part of the worst-hit Tacloban in Leyte province, local ANC television reported on Wednesday. On Tuesday, eight people were crushed to death after thousands of typhoon survivors stormed a government rice warehouse. Police and soldiers were helpless when the looting took place, National Food Authority spokesman said. The looters in Alangalang municipality carted away over 100,000 sacks of rice. Warehouses owned by food and drinks company Universal Robina Corp and drug company United Laboratories in the storm-hit town of Palo, along with a rice mill in Jaro, were also ransacked. “The looting is not criminality. 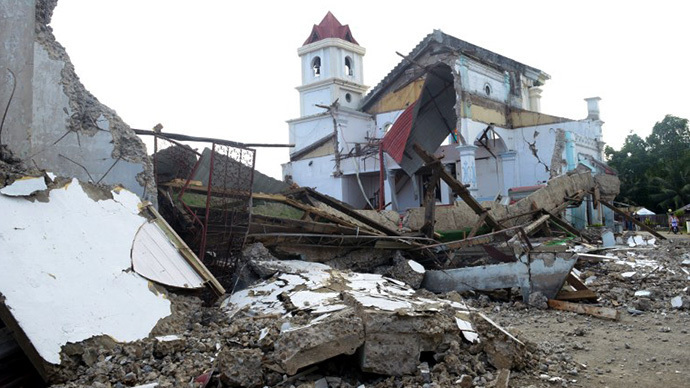 It is self-preservation,” Tacloban city administrator John Lim told Reuters. Tacloban, the principal city in Leyte province which has also become the main relief hub, currently lies in ruins, with communications and transport cut off in many areas. A 4.8 magnitude earthquake has hit the Philippines island of Bohol just days after a powerful typhoon left thousands dead in the Pacific nation. The quake’s epicenter was in the San Isidro municipality of the island province, according to a USGS report. It is located some 45km from Tagbilaran, the provincial capital that has almost 100,000 residents. The tremor hit at the depth of about 70km, according to early USGS estimates. The Philippines Institute of Volcanology and Seismology put the depth of the quake much less deep, at just 9km. It said it was an aftershock of the 7.2 magnitude quake that hit the island on October 15. No immediate casualty or damage report is available. The authorities did not issue a tsunami alert following the quake. Last month’s quake killed 22 people and displaced tens of thousands. It also caused damage to more than 73,000 structures. Bohol Island is located just south of the path of devastation left behind by the powerful Typhoon Haiyan, known locally as Typhoon Yolanda. The typhoon, which was the strongest to hit the country in decades, left an estimated 10,000 people killed and leveled thousands of homes. Philippines declared a state of national calamity as search and rescue operations continue. An estimated 10,000 people might have been killed in the central Philippine province of Leyte alone, which was almost completely destroyed by the powerful typhoon Haiyan, local authorities said. The typhoon has devastated up to 80 percent of the Leyte province area as it ripped through the Philippines, Chief Superintendent Elmer Soria told Reuters. “We had a meeting last night with the governor and other officials. The governor said based on their estimate, 10,000 died,” Soria said. “The dead are on the streets, they are in their houses, they are under the debris, they are everywhere,” said Lim, adding that only about 400 bodies have been recovered so far. The Red Cross said earlier that 1,200 people we confirmed dead in the Philippines. Roxas said earlier on Saturday that it was too soon to announce any final figures. The worlds strongest storm in recorded history, Typhoon Haiyan (also named Yolanda), with sustained winds reaching 195mph — gusts up to 235mph. This massive storm originally began its rotation , was born out of a microwave anomaly in the West Pacific. This video discusses the findings, and possible origin of the microwave pulse. Coming from where???! US Airforce base near the location, the base is a satellite communications hub. This has happened before, Storm control via microwave pulse .. seen during other Hurricanes such as “Sandy / Frankenstorm”, Hurricane Irene, and Chantal. At least 100 people are presumed dead in Tacloban City, according to Reuters, as one of the most powerful-ever tropical cyclones based on wind speed has moved over the Central Philippines. The death toll expected to rise, authorities said. Super Typhoon Haiyan has caused at least 100 deaths in the Philippines, according to a senior government official. Huiyan hit the Filipino island of Samar Friday, forcing millions to flee the area. Haiyan is billed as the strongest – by wind speed – storm ever to hit land, with sustained wind gusts of 170 mph (275 kph), according to the Joint Typhoon Warning Center. The storm is moving out of the Philippines after devastating property, triggering landslides and floods and power and communications on multiple islands. Captain John Andrews, deputy director general of the Civil Aviation Authority of the Philippines, reported bodies in the streets in the central city of Tacloban. Power and communications in the three large island provinces of Samar, Leyte and Bohol were almost completely down Friday. Authorities and telephone companies pledged to restore services within 24 hours, however. Thirteen airports have been shut down, with close to 450 domestic and eight international flights suspended. 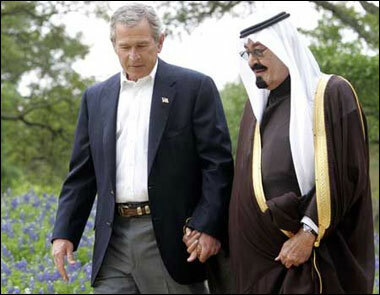 Terrorists are US-Saudi Funded Extremists – Part of Engineered Destabilization. Thousands of Tausug from Basilan, Sulu and Tawi-Tawi have sailed to Sabah to reinforce members of the so-called royal army of the sultanate of Sulu who are fighting it out with Malaysian security forces, a Moro National Liberation Front official said Tuesday. The Moro National Liberation Front (MNLF) of course, is one of several of Al Qaeda’s franchises in Southeast Asia, and spun off the notorious terrorist organization, Abu Sayyaf, a US State Department-listed foreign terrorist organization with direct ties to Al Qaeda. The United States suspected a Saudi Arabian ambassador to the Philippines of potential involvement in funding terrorists, according to US diplomatic cables released by WikiLeaks this week. The group was suspected of funnelling funds to Al-Qaeda-linked groups based in the southern Philippines. Intelligence agencies have said IIRO was set up by Muhammad Jamal Khalifa, a brother-in-law of Al-Qaeda chief Osama bin Laden. Overall, the WikiLeaks cables singled out Saudi Arabia as the key source of funding for radical Islamist groups including Al-Qaeda, the Taliban, Lashkar-e-Taiba and Hamas. Saudi Arabia is of course is the chief financier of Al Qaeda, and is currently leading efforts to fund, arm, and fill the ranks of Al Qaeda’s franchises from Mali and Libya, to Syria and Iraq. A multitude of reports from across the West have identified Saudi Arabia as the lynch pin in Al Qaeda’s global terror campaign, including the US Army West Point Combating Terrorism Center. Its reports “Al-Qa’ida’s Foreign Fighters in Iraq” and “Bombers, Bank Accounts and Bleedout: al-Qa’ida’s Road In and Out of Iraq,” identify a vast terrorist network maintained by the Saudis that recruits, arms, and funds terrorists from across the Muslim World, and can funnel a mercenary army into any desired nation. At the time, the desired nation was Iraq. In 2011, it was Libya. Today it is Syria. The same network that US soldiers fought in Iraq is verifiably in use today, in support of US regime-change operations in Syria. The US maintains permanent military bases inside Saudi Arabia, funds the Saudi military, and has recently concluded the largest arms deal in US history with the Saudis. Additionally, Saudi Arabia’s brutally repressive internal security apparatus is a creation of US advisers and operators. It is clear, most acutely in Libya and Syria, that the use of Saudi Arabia’s global Al Qaeda mercenary army serves both Saudi Arabia’s interests as well as Western geopolitical ambitions, including to exact regime change around the world. And it just so happens that the West and Saudi Arabia both seek regime change in currently Russo-Iranian-Chinese friendly Malaysia. Anwar Ibrahim, head of Malaysia’s opposition coalition, which includes the Malaysian Islamic Party (PAS), has spent a lifetime in the service of Western interests. Anwar Ibrahim was Chairman of the Development Committee of the World Bank and International Monetary Fund (IMF) in 1998, held lecturing positions at the School of Advanced International Studies at Johns Hopkins University, was a consultant to the World Bank, and a panelist at the Neo-Con lined National Endowment for Democracy’s “Democracy Award” and a panelist at a NED donation ceremony – the very same US organization whose subsidiaries are funding and supporting Bersih, a faux-pro-democracy Western-funded street movement that in fact was created by, and in the service of Anwar Ibrahim’s political ambitions. Anwar Ibrahim’s affiliations with Malaysian “Islamists,” the already active political subversion his US State Department-funded Bersih movement is sowing in Malaysia’s streets, and his Western backers’ habitual support for terrorism internationally as a geopolitical tool, raises the possibility that his opposition movement is complicit in the conveniently timed militant destabilization Malaysia now faces, only months before 2013’s general elections. This may be why the Western media refuses to properly cover an otherwise very noteworthy conflict. The fact that these militants are emanating from long-time US ally, the Philippines, and the Philippines’ current role in assisting the US “pivot” towards Asia, and more specifically facilitating a proxy confrontation with China, illustrates the greater regional implications at play. The US intends to install client regimes in Myanmar led by Aung San Suu Kyi, Thailand led by Thaksin Shinawatra’s despotic political dynasty, and in Malaysia led by Anwar Ibrahim. Together, this front will then be turned against Chinese interests as part of a long-planned desire to encircle and contain China. It will be done so under ASEAN and at the cost of Asia’s stability and prosperity. 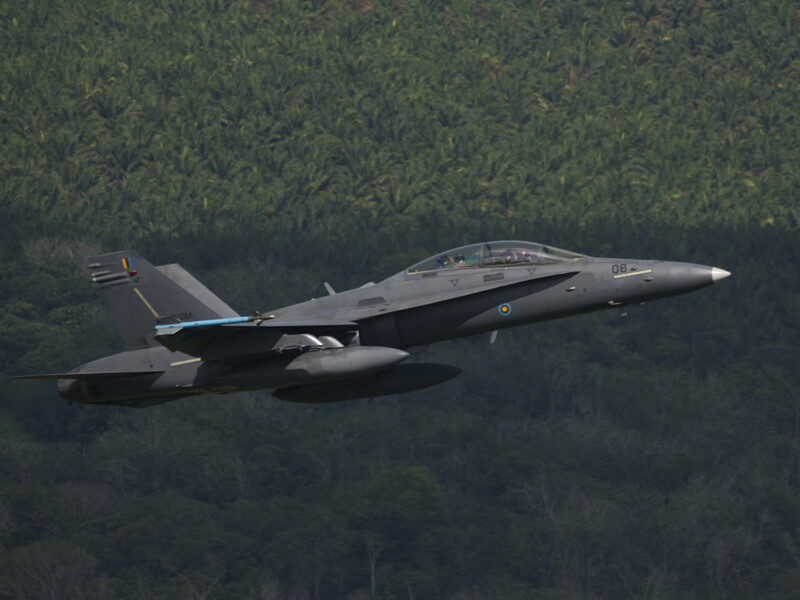 The future of Asia hangs in the balance, and therefore conflicts like Malaysia’s battle against armed extremists in Sabah may not be covered by the Western press, but it must be covered by the alternative press. The unhinged insanity that is now spilling blood on Malaysia’s shores, also represented by the West’s proxy Anwar Ibrahim and his attempts to provoke street protests against the ruling government, illustrates just how dangerous the current Anglo-American international order is, and how far its reach extends. We must identify the corporate-financier interests driving this agenda, – interests we most likely patronize on a daily basis, and both boycott and permanently replace them to erode the unwarranted influence they have used, and will continue to use against people the world over.